Live & eat pie. Great Taste 2018. 100% farm assured British beef. Made with free range eggs. Good Egg Award. A British beef steak and Gem ale pie, made with 100% British beef and Bath Ales Gem. 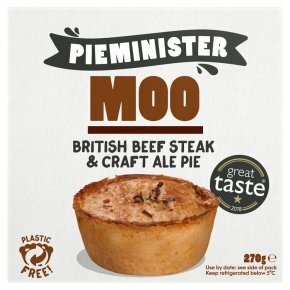 The Moo pie is Pieminister's best-selling pie and was awarded a Great Taste Award in 2015. Try this pie with a traditional side of mash, gravy and a splash of Worcestershire sauce to make for the perfect meal. Remove all packaging and place the pie on a baking tray. Put in a pre-heated oven. Defrost thoroughly in the refrigerator and then follow instructions for 'From fresh'.